This cuff link or ‘sleeve button’ – made in the mid 1700s – was recovered by archaeologists from George Washington’s boyhood home at Ferry Farm. It is one of the earliest examples of the Washington family’s resistance to King George III. What makes this sleeve button so interesting is the man depicted: King William III, who ruled England with Queen Mary. This sleeve link was made two generations after the death of this monarch. Nonetheless one of the Washington brothers wore this politically provocative accessory. What made William III, a monarch who died in 1702, an attractive choice for colonial apparel during the mid-1700s? The answer resides in this sleeve link’s political dimensions and reflects the Washington family’s early resistance to Crown policy. November is an appropriate time to remember the polemical reign of William and Mary: they were married on November 4, 1677 and William landed at Torbay, England, November 5, 1688 to begin battles against the supporters of King James II, then ruler of England. When the unpopular James fled to France with his wife and young son (heir to the throne) parliament met and, after some deliberation, offered the monarchy to William and Mary. Individual rights, representative government, and justified rebellion became associated with the rule of William and Mary and were part of annual celebrations held for this sovereign pair for generations. Popular items such as coins, playing cards, plates, mugs, and pamphlets reinforced these connotations throughout their reign and beyond. Cuff links, such as the William III link from Ferry Farm, were popular fashion accessories throughout the 1700s. Made from a molded glass ‘gem’ (see photo) originally situated within a copper-alloy setting (not shown), this sleeve button featured King William III’s silhouette. It was modeled after coins that depicted the English monarch beginning in the mid-1690s (see image). At that time, the king’s profile, along with his name “Gulielmus” (in Latin) followed by the initials “D. 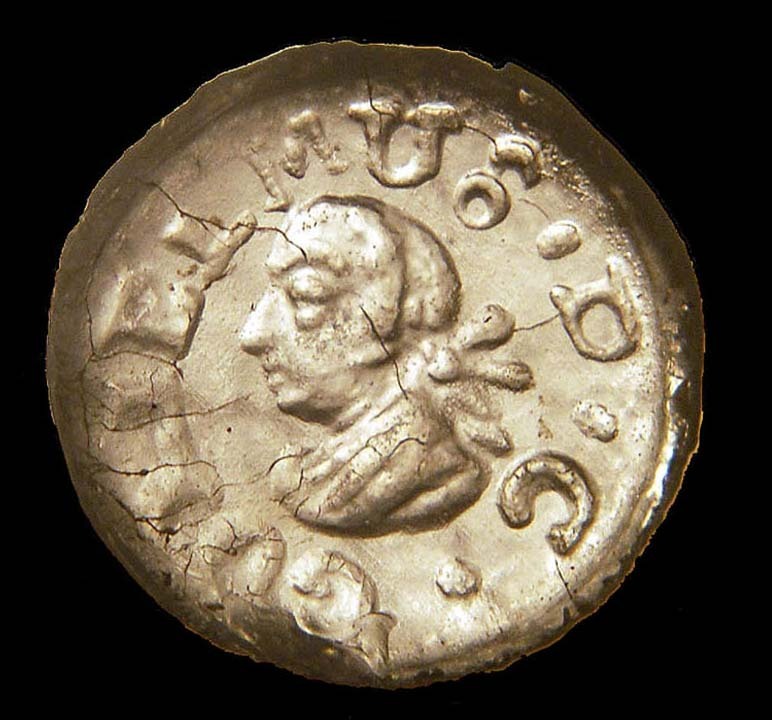 G.” – an abbreviation of the Latin dei gratia (by the grace of god [King]) – were prominently featured on currency. A 1697 sixpence featuring King William III. This silhouette (and text) inspired the design of the mid 1700s sleeve link from Ferry Farm. Beginning in the mid-1700s, when the Washingtons wore their William III sleeve link, tensions were growing between Britain and her North American colonies, incited by the colonists’ concern over the policies of King George III. The Sugar Act and the Stamp Act taxed American colonists, even though they had no representation in parliament. Colonists asserted that this was a violation of their rights under the English Bill of Rights (enacted in 1689 under the reign of William and Mary). Thanks to a popular campaign that originally began in the 1690s, William and Mary came to represent the right of subjects to resist a king who was abusing power, and this narrative proved to be enduring. In fact, colonists supported this narrative with other figures in English history. As the Washingtons were looking to William and Mary to legitimize their resistance to King George III, Thomas Jefferson took as his role model Oliver Cromwell, whose rebellion resulted in regicide and who was considered particularly militant by the colonists. While the Washingtons owned cufflinks to celebrate William and Mary, Jefferson owned a miniature depicting the far more revolutionary Cromwell. Regardless, William III thus became a symbol for American colonists in general, and the Washington family in particular, as momentum grew to resist crown powers during the mid-1700s. By wearing this sleeve link, the Washingtons proclaimed their enduring support for representative government. And, we all know where that led—the American Revolution and birth of the United States, whose first president grew up at Ferry Farm. 2012 Linked Buttons of the Middle Atlantic, 1670-1800. Journal of Middle Atlantic Archaeology 28:99-116. 1992 The Glorious Revolution and the British Empire 1688-1783. In The Revolution of 1688-1689: Changing Perspectives, edited by Lois G. Schwoerer. Cambridge University Press, New York, pp. 260-271. 2012 The 1688 Landing of William of Orange at Torbay: Numerical Dates and Temporal Understanding in Early Modern England. The Journal of Modern History 84(3):539-571. 2006 The King’s Three Faces: The Rise and Fall of Royal America, 1688-1776. University of North Carolina Press, Chapel Hill. 1990 Celebrating the Glorious Revolution, 1689-1989. Albion: A Quarterly Journal Concerned with British Studies. 22(1):1-20. 1989 Images of Queen Mary II, 1689-95. Renaissance Quarterly, 42(4):717-748. 1977 Propaganda in the Revolution of 1688-89. The American Historical Review 82(4):843-874. 1992 The Politics of Legitimacy: Women and the Warming-pan Scandal. In The Revolution of 1688-1689: Changing Perspectives. Cambridge University Press, New York, pp. 65-82.